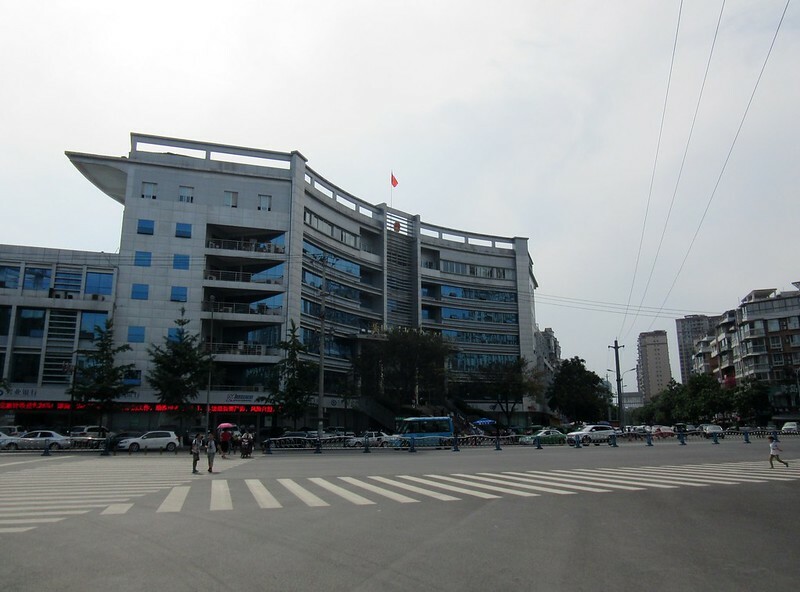 The office itself is easy to find, it’s a big government building (Government Affairs Service Centre) on the corner of Fenghuang Road and Jiaxiang Road, opposite the Xingbang Holiday Hotel. 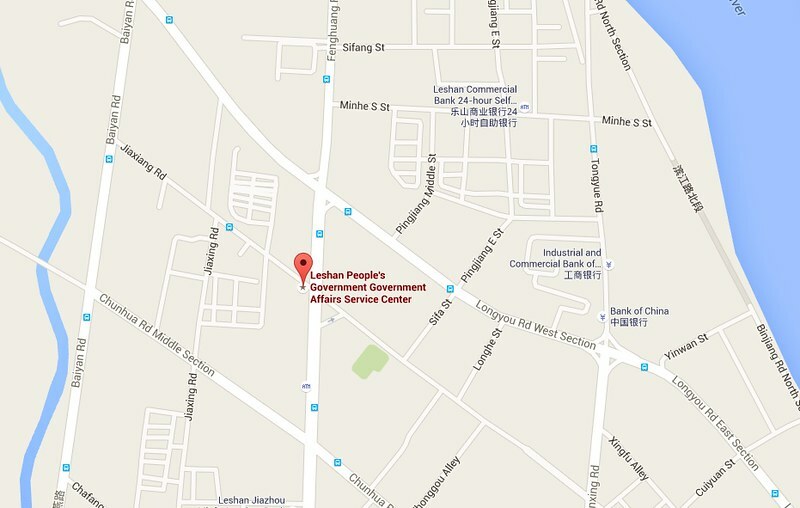 You enter on the second floor, and the Exit and Entry Service Center is on the third floor. 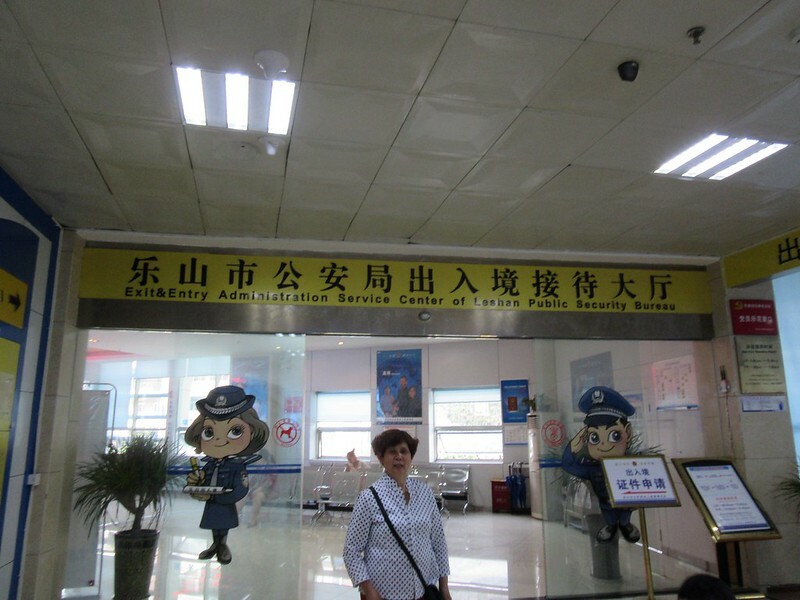 We arrived a few minutes before they opened at 9am, but a friendly woman who looked to be a supervisor beckoned us in and told one of the staff members to stop eating breakfast and take our documents! We’d prepared photocopies of our passport photo page, existing visa and entry stamp. We also had the registration slip from the hotel where were staying that evening. They only had a quick glance at this before returning it (when we checked out of the hotel I noticed that they’d printed the dates incorrectly anyway, so they can’t have checked it very throughly!) We had a passport photo each, but fully expected to need new photos taken by an official photo shop, where you get a barcoded print. But they were fine with our current photos and just printed out a barcode which they stuck on our application form with the photo. The one thing that we weren’t expecting was that they gave us an additional form to fill out with our itinerary and hotel info for the next 30 days. We were able to come up with something, finding hotel names on Pocket Earth on my phone. I didn’t need a flight booking to show we were leaving or any evidence of hotel bookings. Again, they only had a quick look at this document. We had completed and submitted everything within an hour of arriving and were told to return at 4:00pm the following afternoon (we kept our passports). We were back at 3:45 and our extended visas were waiting for us, ready to be stuck into a passports. 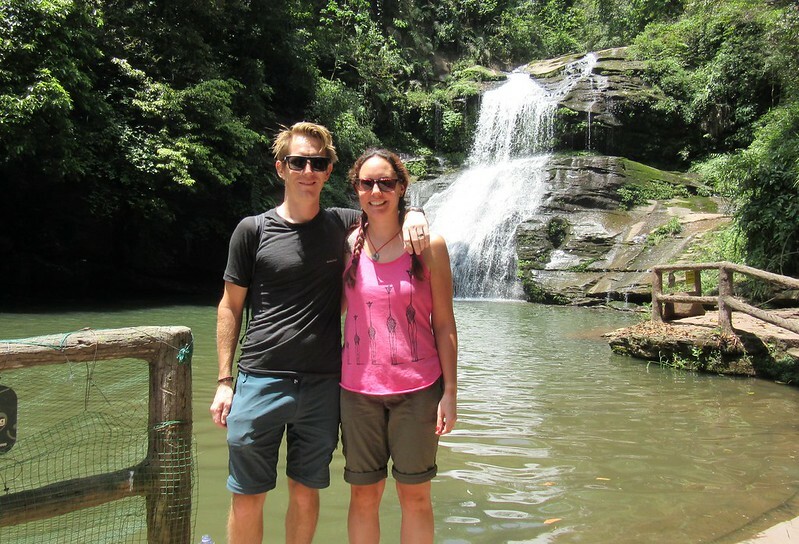 The bonus was that our extra 30 days would start from when our old visas expired, maximising our time. Often the old visas are cancelled when you submit an application, or the new ones start early, meaning you can lose several days. 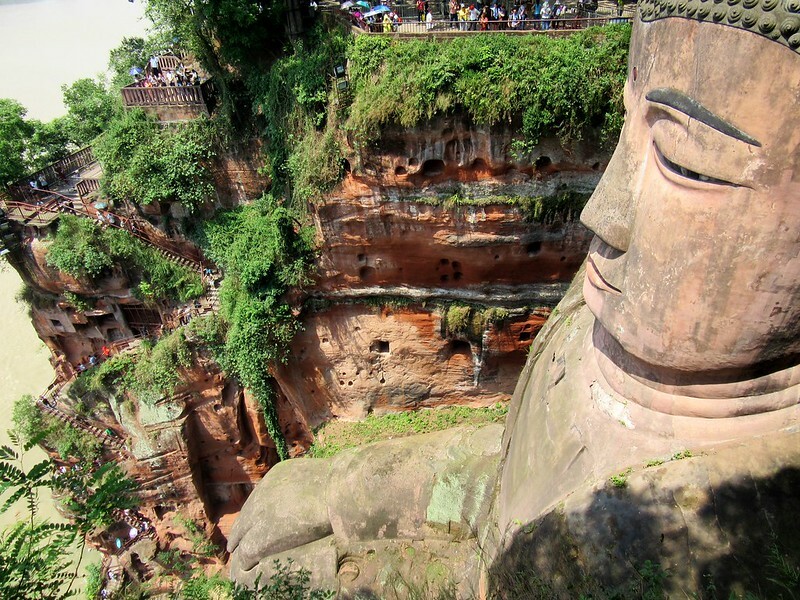 All in all, it was a totally painless process, so we’d definitely recommend Leshan if you’re in that part of Sichuan and need a visa extension. 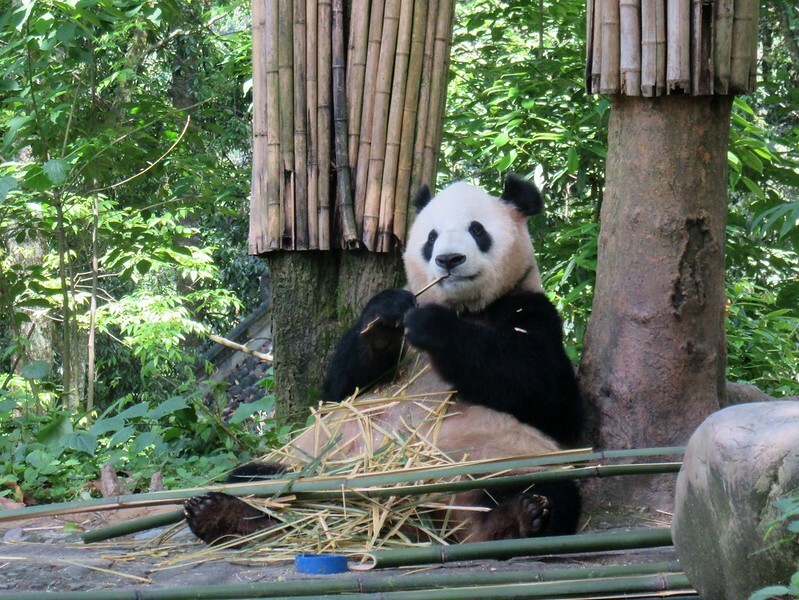 With the extensions in the bag, we now had plenty of time to get up to Chengdu. As you can see from the number of kilometres at the top of this post, we did a lot of sightseeing this week and not a lot of cycling! It’s been a nice change, usually we don’t go in to the tourist sites as the admission fees are high and we’re often in a hurry to keep moving. 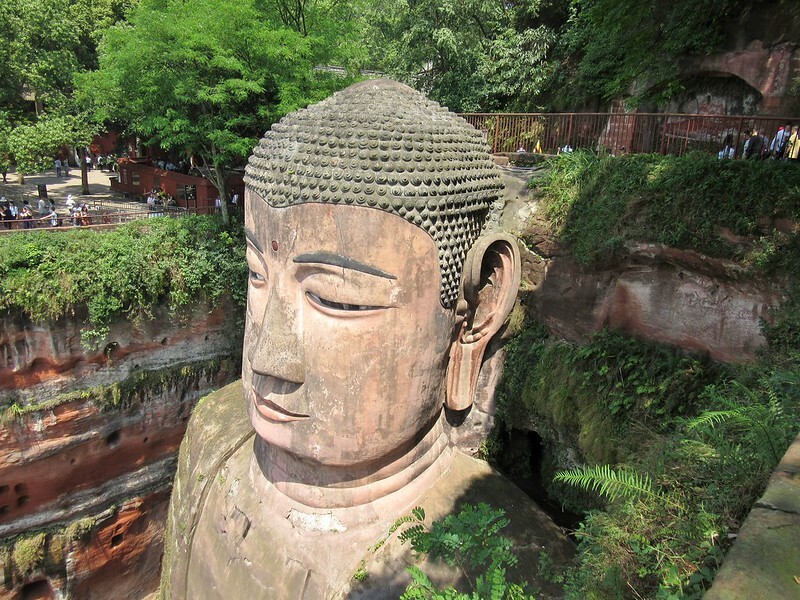 In Leshan, we stayed an extra day and went to visit the Giant Buddha. 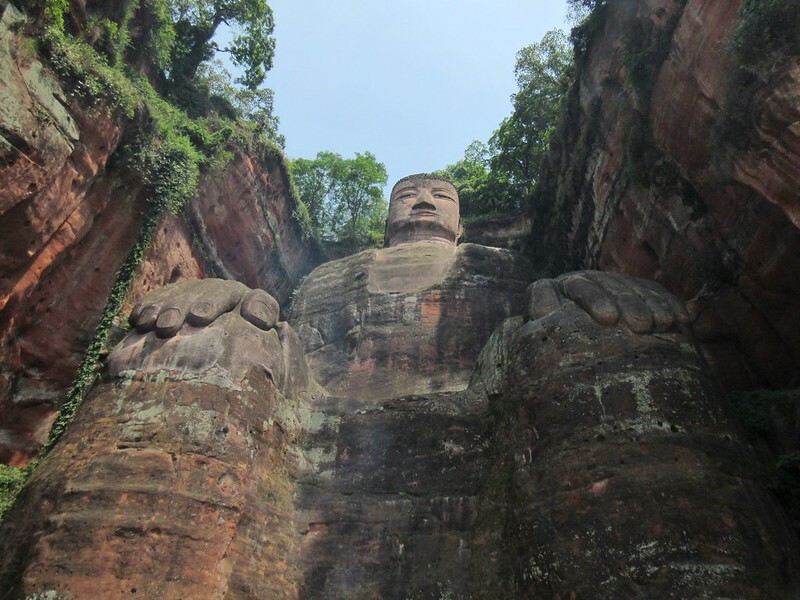 It’s the largest in the world apparently, 71 metres tall, carved into the cliffs next to the river facing the city. To get to it, we walked down a steep narrow staircase cut into the cliff face. I was ready to be underwhelmed but it was a really impressive site, and well worth visiting. 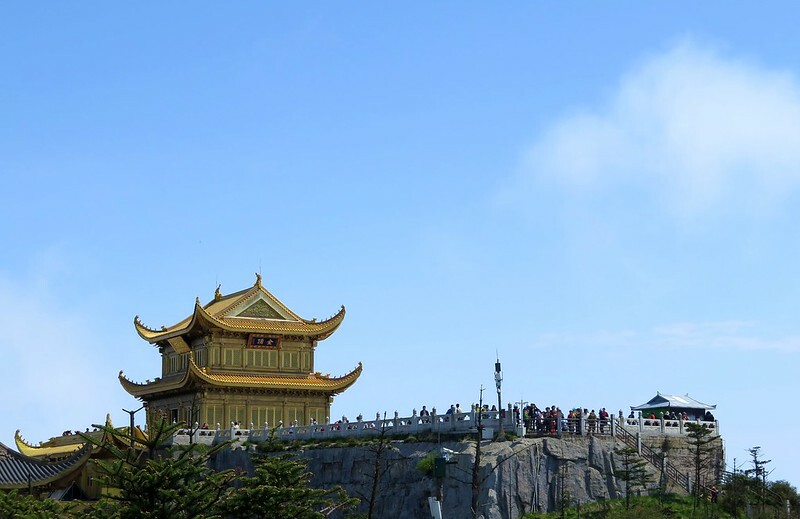 The weather forecast was looking better for the following few days, so we decided to head back to Emeishan and give it another go. It was deja-vu riding back into the tourist area at the base of the mountain, although we stayed in the hotel opposite our previous one, which had no hot water! We woke early to take a bus into the national park area, dropping us off at the base of a gondola which also to my surprise is a ski area in the winter. 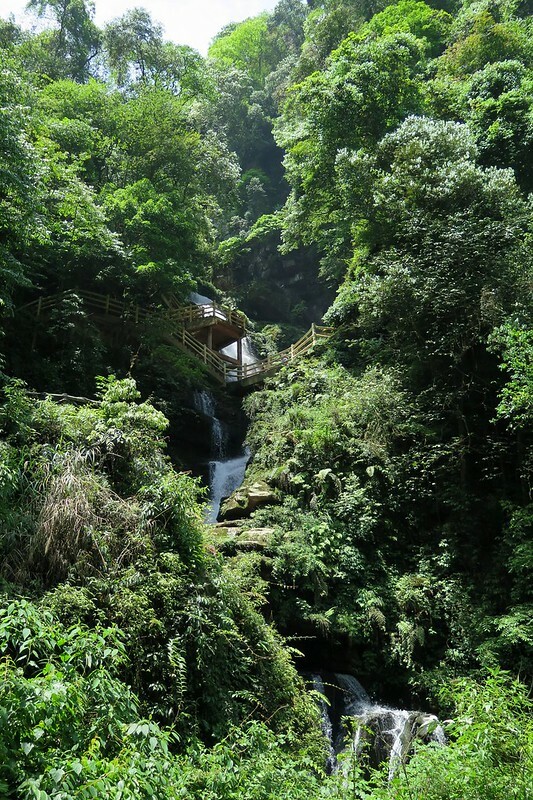 Many of the visitors take the gondola to the top, so the hiking trail that we used was nice and quiet. 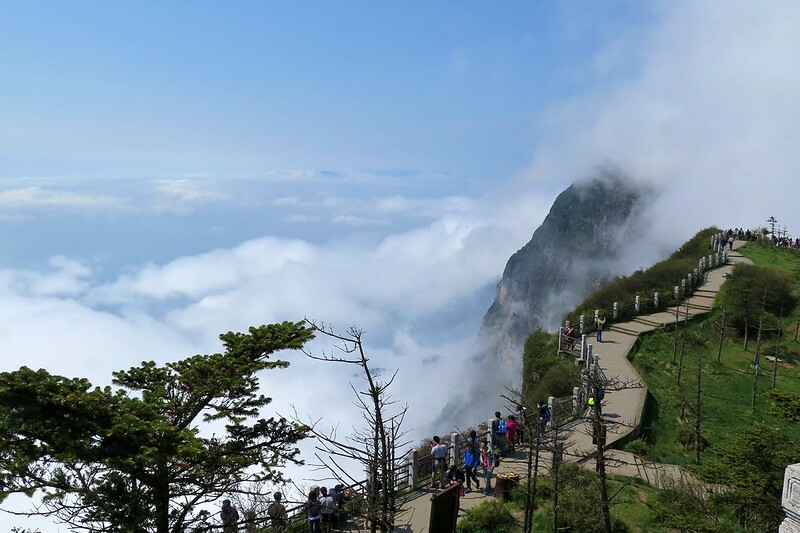 The bus ride up took us through the cloud layer, so we were up above the sea of clouds in the sunshine. It wasn’t a long hike but it was fairly steep and up over 3,000 metres altitude so it wasn’t a total walk in the park. 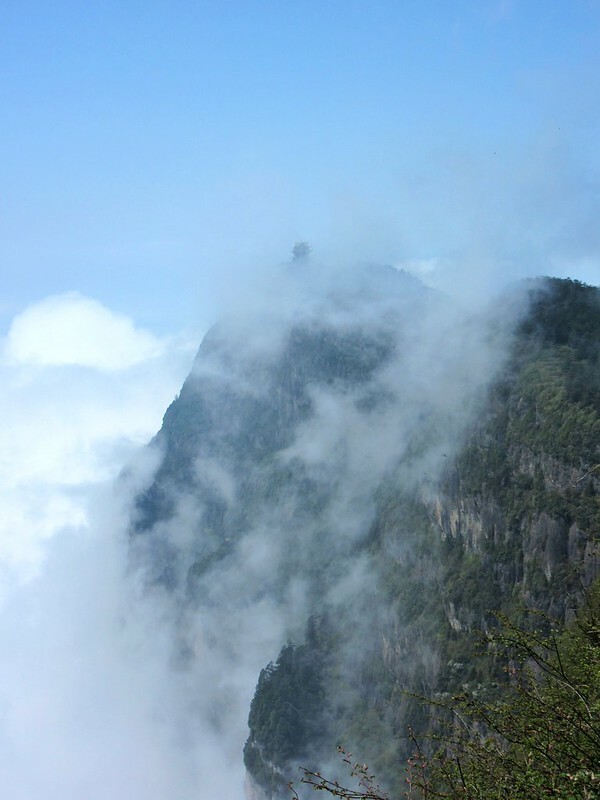 At the top there’s a big temple which sits overlooking a knife edge ridge, dropping away into the clouds below. The cloud base was rising as the morning wore on, so we were lucky to catch it in good weather. We were back into clouds soon after we started the walk back down. 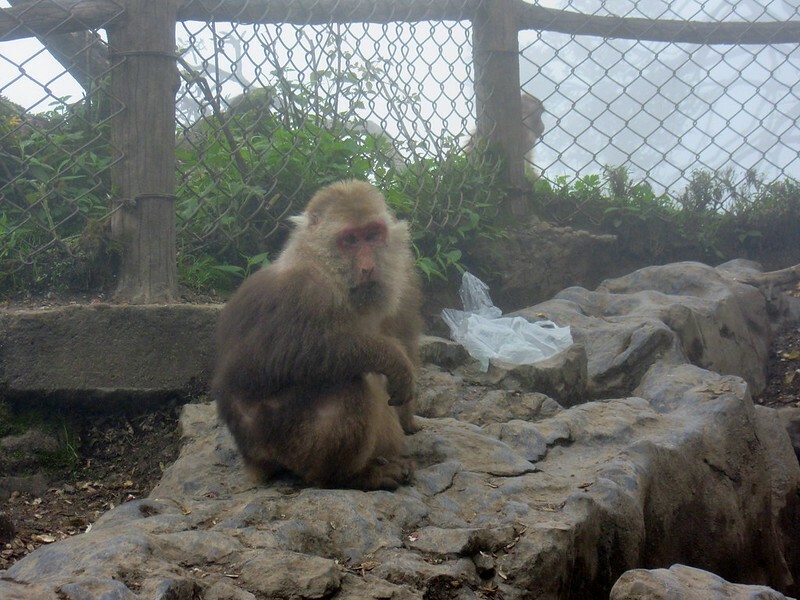 Near the bottom, we came across a pack of the infamous monkeys which live on the mountain. One had nicked a woman’s handbag and was sat in the middle of the trail growling and flashing its teeth at anyone trying to get it back! 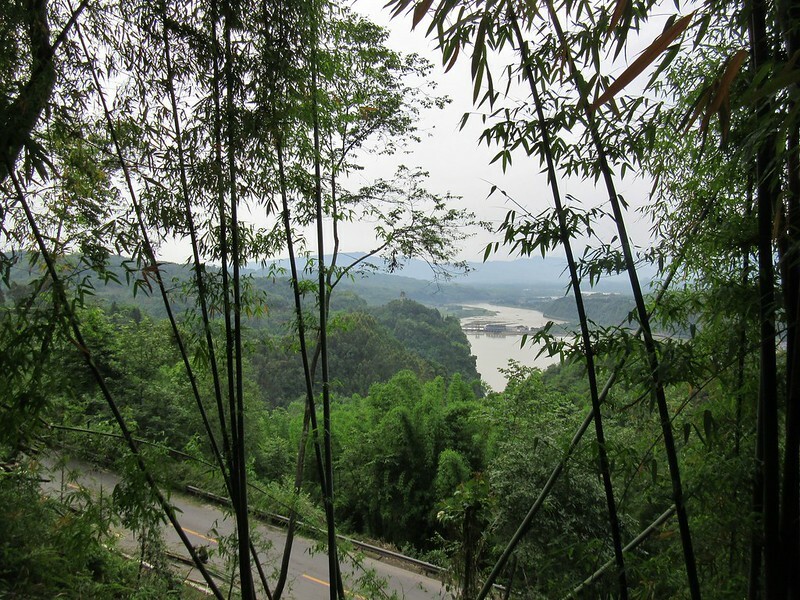 We left Emeishan the following day, heading north towards Ya’an. It was drizzling as we set off, then after 10km it started raining very heavily. 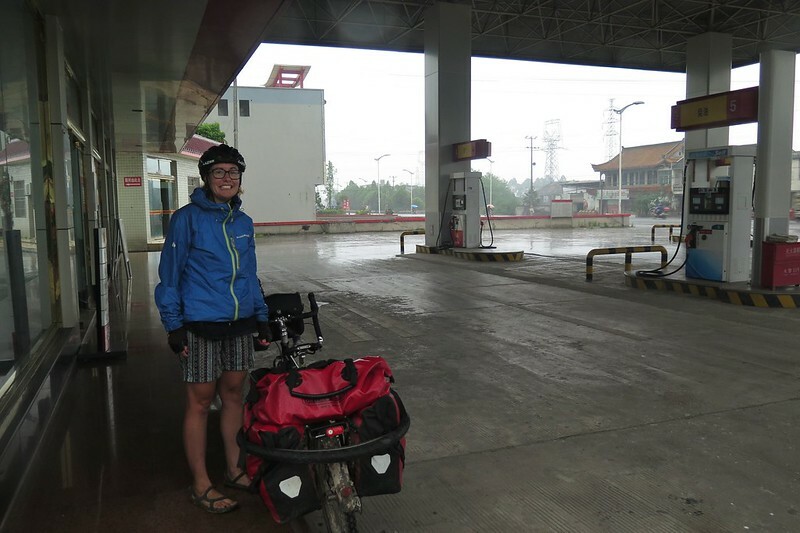 We took shelter at a petrol station, using the downpour as an excuse for an early tea break. The nice staff there saw us and brought out a couple of chairs for us to sit on while we waited 30 minutes until the rain eased off. 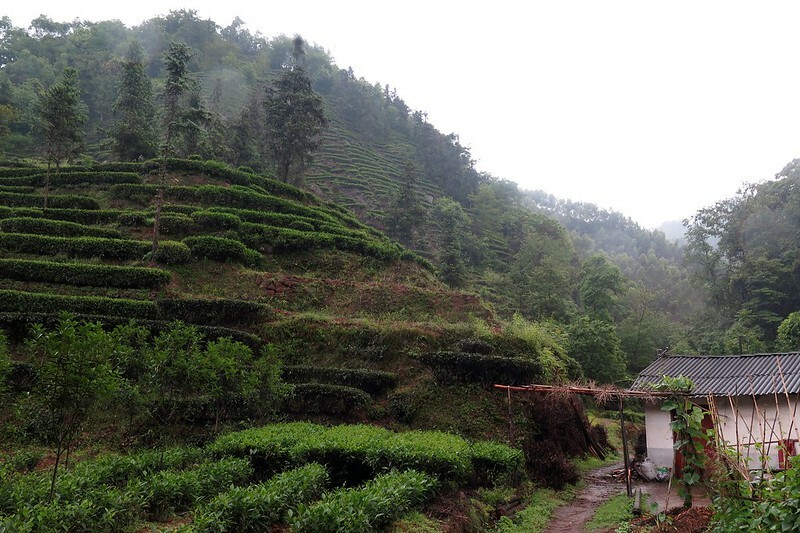 We set off again, in light rain and turned off the main road onto an unnumbered minor road that weaved through tea plantations in the hills. It was our first full day riding in the rain for over 3 months! 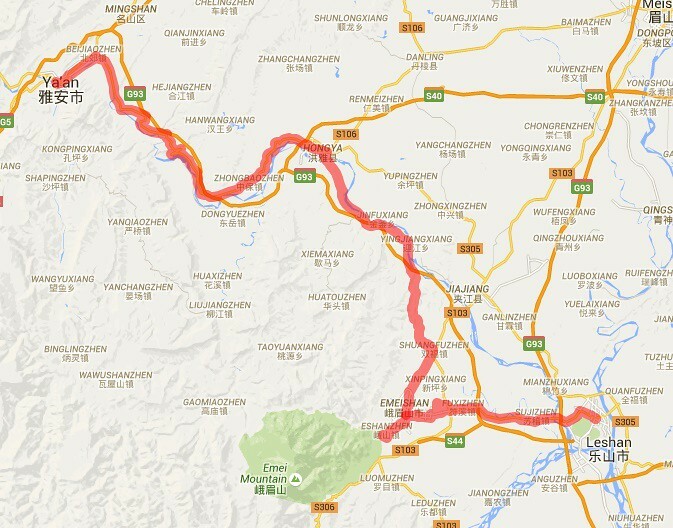 It was only 110km or so to Ya’an but we split it over two days. The rain stopped on the second day and we had a nice ride following a river, heading towards some bigger mountains in the distance. Great views, even with an overcast sky. It was mostly flat, with a few sections of climbing up and over the hills beside the river. 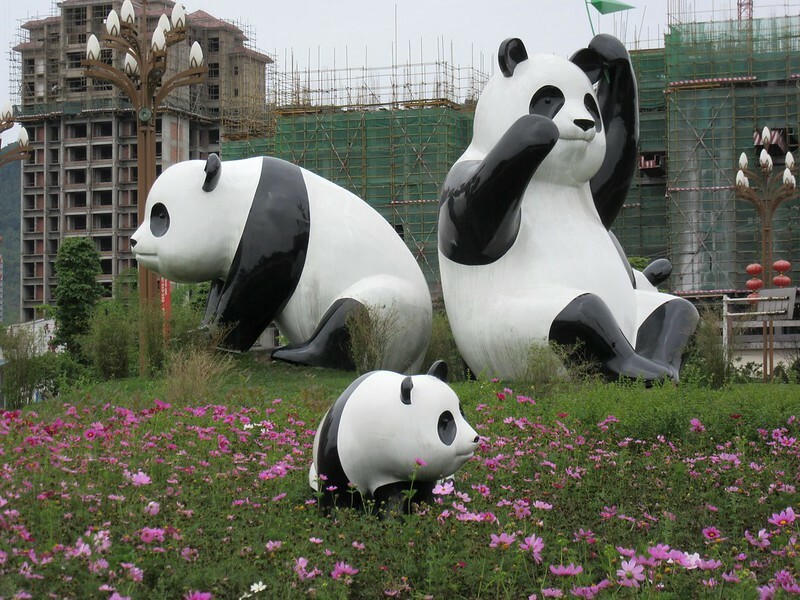 When we got to the outskirts of Ya’an, the panda sightings started! Not actual pandas, but signs, pictures and statues everywhere. 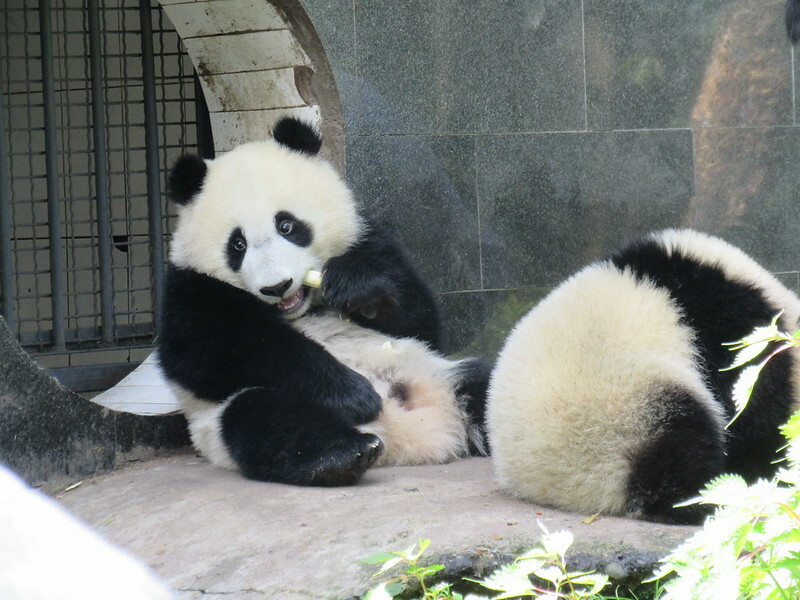 The nearby Bifengxia Panda Centre is clearly the main reason for people visiting the town, us included. On our way in, we stopped for some lunch at a restaurant that we were beckoned into as soon as we pulled up on our bikes. 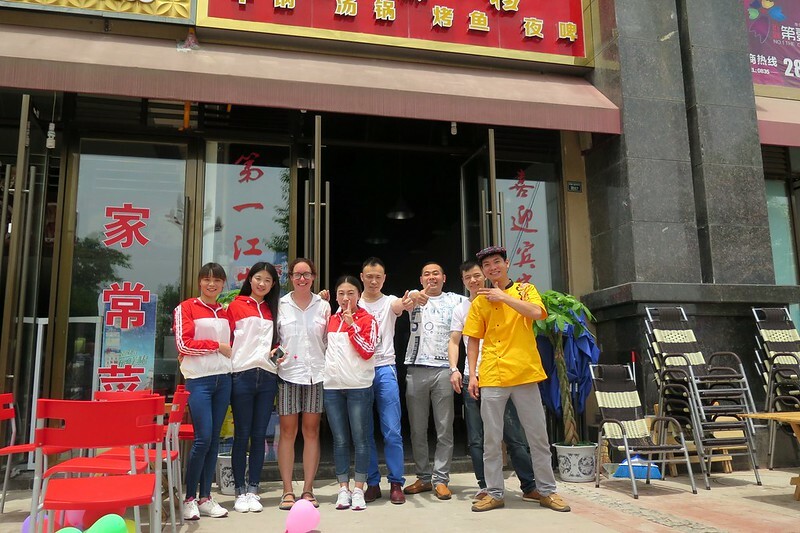 They were super friendly, helping us to translate the menu and wanting to take photos with us when we left. Riding into town was a pain. The main central street is being dug up and so traffic is restricted, which made looking for a hotel quite tricky. Being a tourist town, the prices were quite high so it took us a while to find somewhere. Once we had, we left the bikes and went for a wander down to the river, away from the roadworks. There’s an old bridge and a really nice riverside path with a few restaurants. A great spot for some people watching and an early evening beer or two. 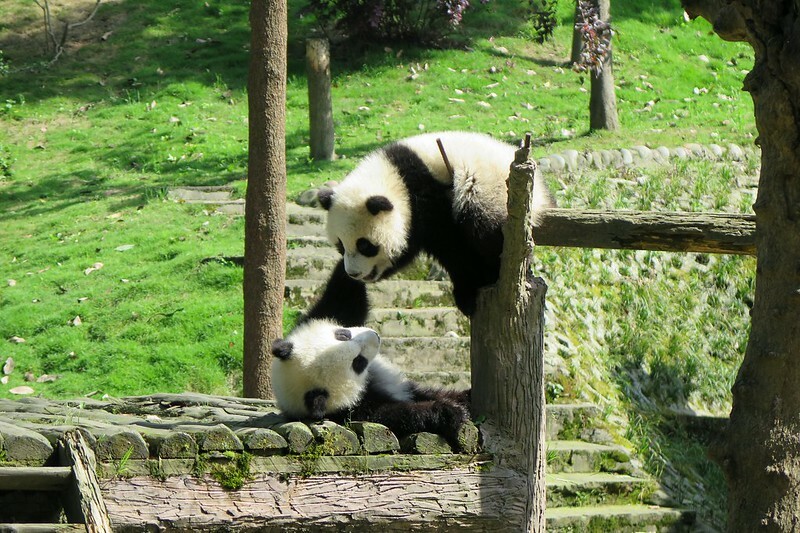 The next day, we went up to see the pandas. 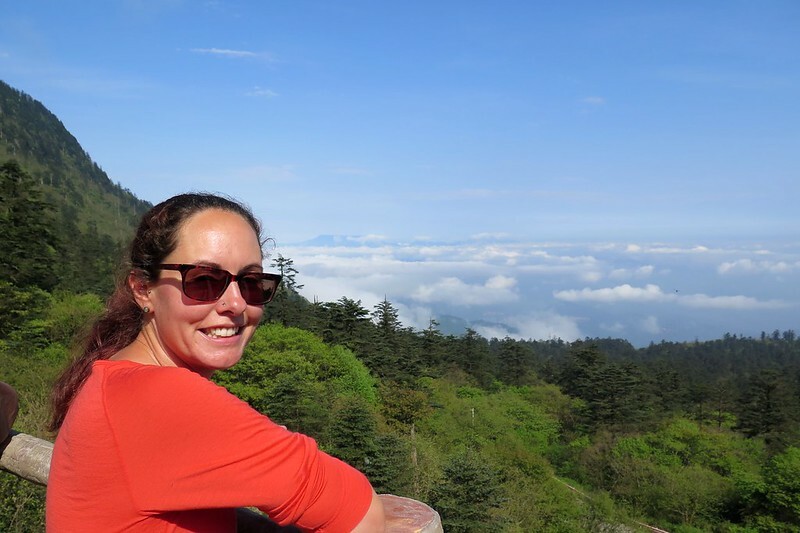 Taking two days to ride from Emeishan ensured that we visited the Panda Centre on a Monday to hopefully avoid the crowds. 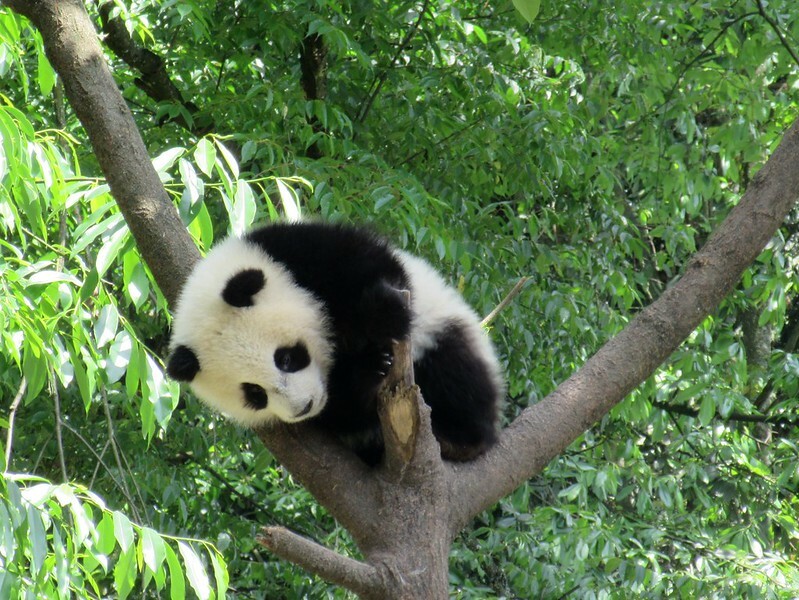 There are a few different places to see pandas, the most popular being in Chengdu itself, which gets quite busy. This one is a bit further out and more difficult to access, so doesn’t attract quite as many visitors. 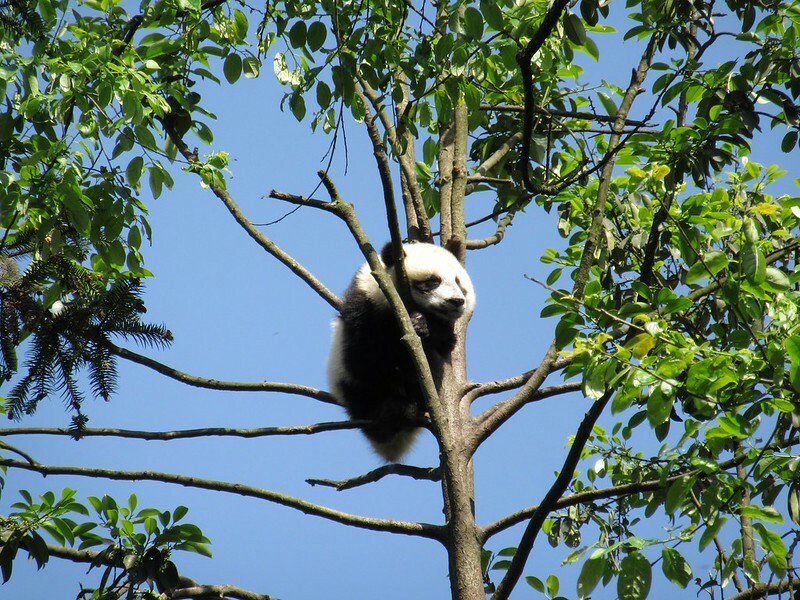 Visiting on a Monday morning was perfect, we took our time walking between the different areas, getting great views of the pandas. The young ones were the most active and interesting, rolling around and play fighting in their ‘Panada Kindagarden’ area. 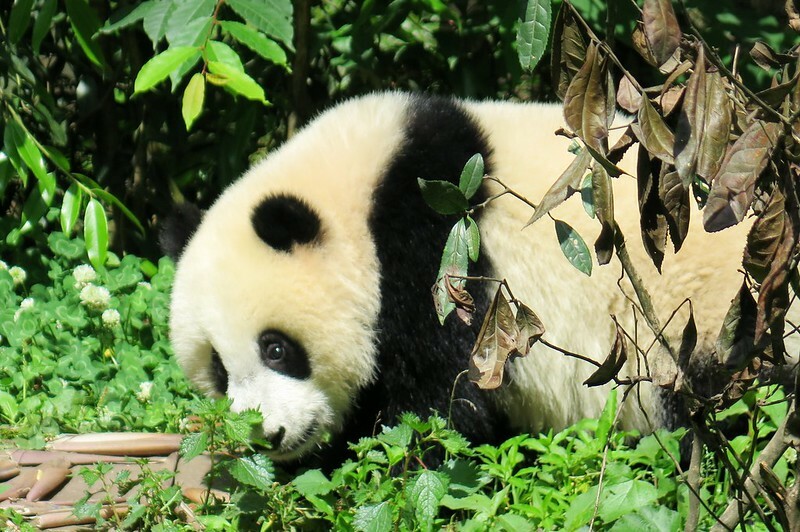 The older ones had big areas to roam around in, but seemed to spend most of their time sleeping, or lazing around chewing bamboo. Here are a few photos. Clare has several thousand more, so if you want more, give her a shout! 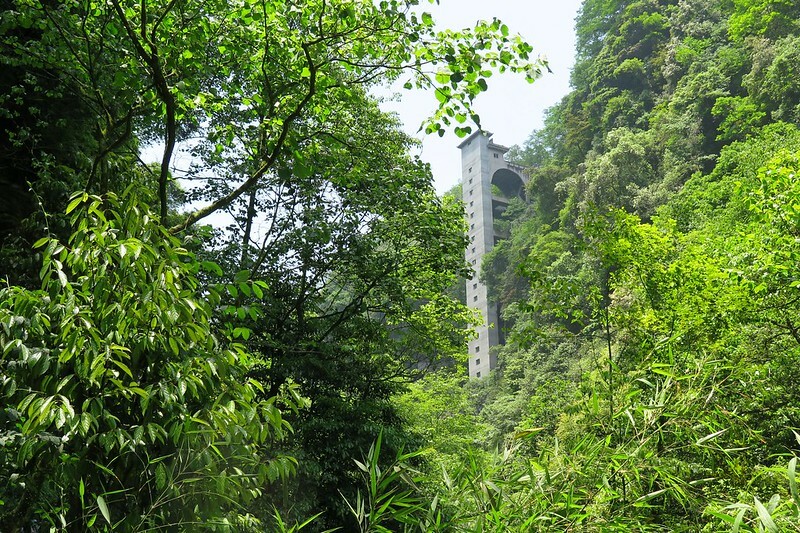 From the panda area, there is an incredible 7km walk through a gorge to get back to the visitor centre. This was an unexpected bonus, which we’d heard about, but we hadn’t expected it to be quite as spectular as it was. 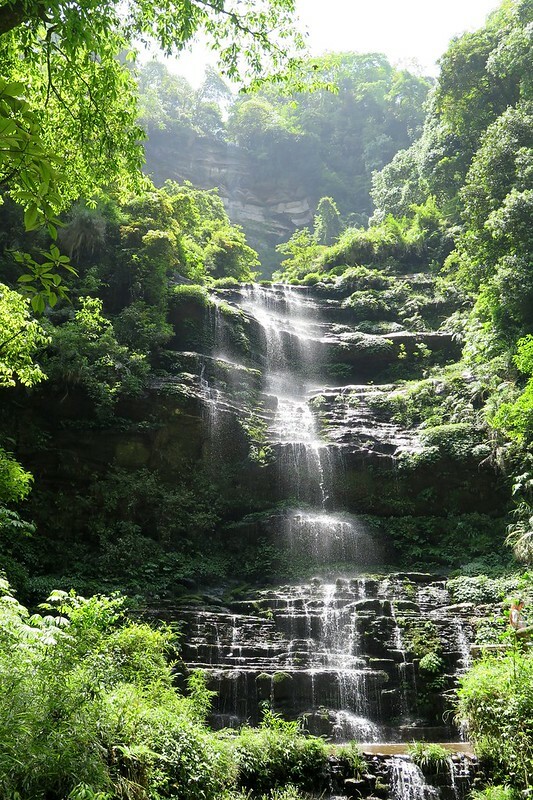 It started off as a mellow trail beside a river, but soon we were walking down steep stairs beside waterfalls with high cliffs around us. At the end of the trail, we were right in the bottom of a tight valley with nowhere to go but up. Conveniently, there’s a lift (elevator, for any Americans reading) built onto the side of a cliff face which took us back up to the top. Thanks Tim! Yeah it’s been great having a more chilled week. Glad you got your visa. 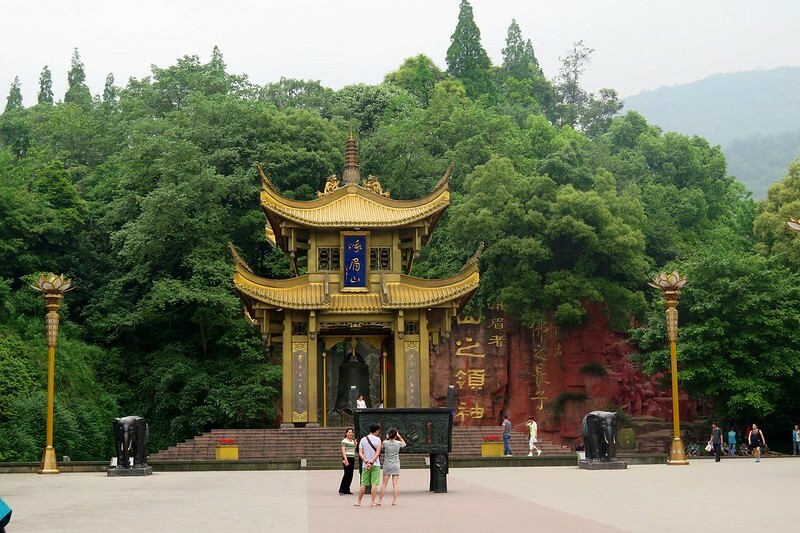 We stayed ini Chengdu when we went to China last year and then went to the border with Tibet and did the notional parks fantastic everything on a much bigger scale than UK. Also saw the pandas, very cute but I am not very happy to see animals caged. Sounds like you have and will be seeing quite a bit of China, massive country of course, fascinating. Have been watching a program recently on the history of China, very interesting. Yes I think Sue and Geoff should be hiring BIKES to see some of Spain!! !